Maven build is the first think we do after working on daily codebase. I usually perform Maven Build hundreds of time in a day. As you may have noticed, on Crunchify almost all of our projects are based on Maven. Maven is one of the best thing happened to Java Developer community. With simple maven clean install, maven clean deploy and more command, your word project just builds and deployed with all dependencies. Maven downloads all of the dependencies download to the path specified in settings.xml file. Do you have a new Macbook Pro and is your Mac running on latest Mac OS X version? If yes, it doesn’t come by default with Maven installed. 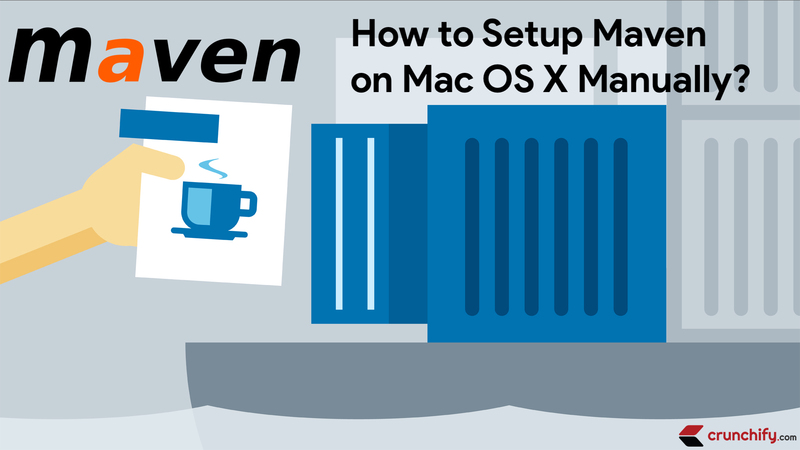 How to install Maven on Mac OS X without Homebrew? Download lates Maven version apache-maven-3.6.0-bin.tar.gz from official site. We are using linux wget command to download it. Connecting to mirrors.koehn.com (mirrors.koehn.com)|209.240.109.238|:80... connected. Above command will download .zip file to /Users/ashah/crunchify folder. Go to ~/crunchify/ folder or /Users/ashah/crunchify folder. Extract apache-maven-3.6.0-bin.zip file using unzip command. Next thing is to setup classpath. Setup maven classpath to your environment variable by updating .bash_profile file. Add below two lines and save the file. Now try again mvn -version and you are all set. Are you getting below error while running command mvn -version? The problem is because you haven’t set JAVA_HOME in Mac properly. In order to fix that add below line to .bash_profile before export M2_HOME line. In my case my JDK installation is jdk1.8.0_91.jdk, make sure you type yours. Just try running maven and you won’t see any issue. I hope this tutorial will help you setup Maven path on Mac OSX quickly and easily.